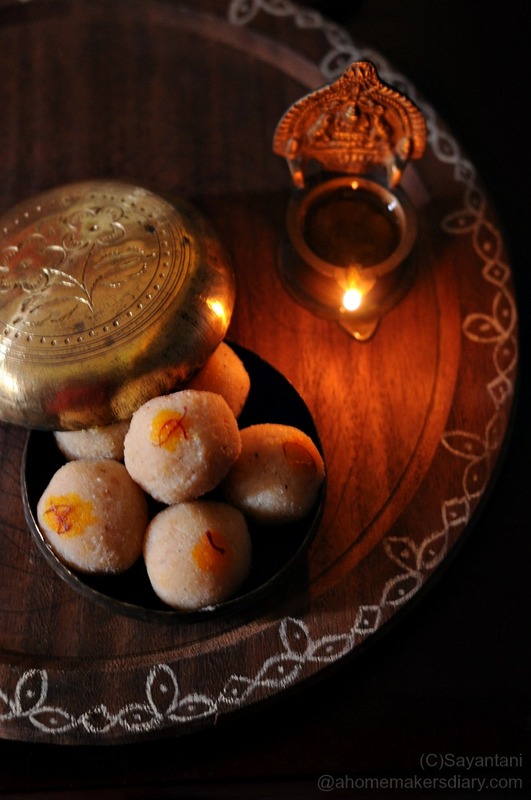 This laddoo recipe was born just out of the quest to save a crisis. 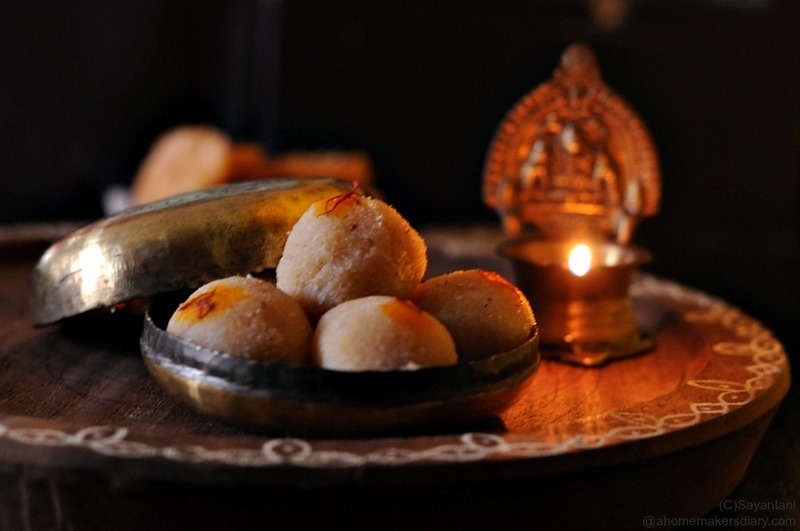 I was newly married and wanted to make narkel naru for Bijoya. After the morning trip to the market to gather the essentials the problem arose when I started scraping the coconut. It was much past it's prime and was hard and fibrous. I knew it could not be turned into a good laddoo. So I looked for options and found a packet of old, unused, unopened pack of powdered milk. All I knew that after half an hour when the hubby came home he was bowled over by the taste and so were all his colleagues a couple of days later. So much so that now a days everyone at home wants me to make this version. 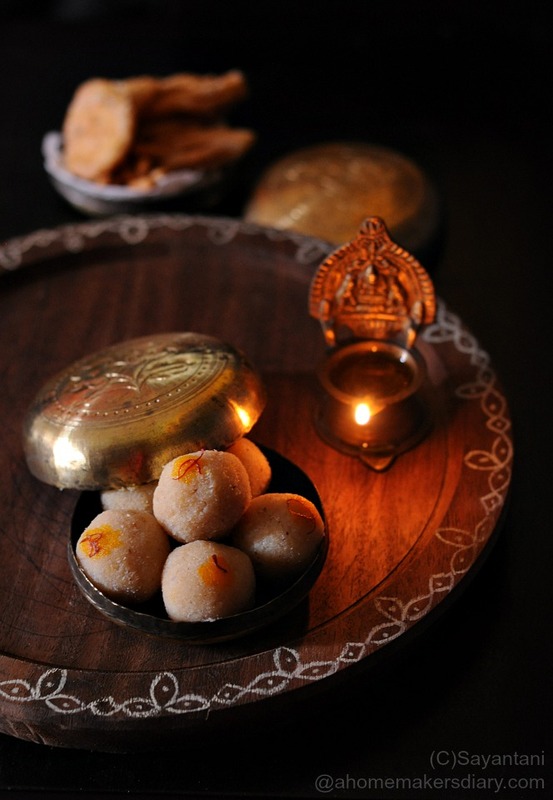 This also makes for a quick Diwali dessert, a saving grace for someone like me. 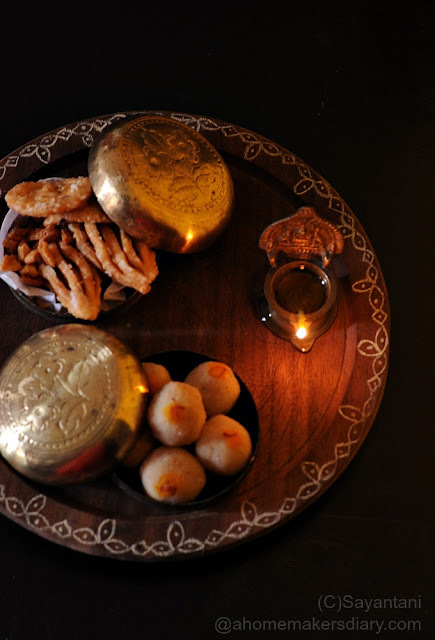 I love cooking and made the usual suspects of Elo jhelo, nimki and jibe goja for Bijoya but after the Diwali cleaning and decoration never feels like making something special. This year the feeling is worse as without the husband the festivities are never enjoyable. I feel like doing everything for the sake of the kids and their happiness. But it's Diwali afterall. 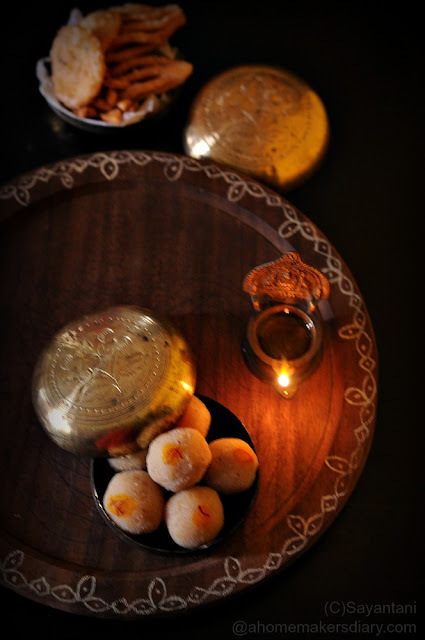 Sooner or later you get to be caught up by the Diwali snacks and sweets making frenzy. So without far ado here is the easy and quick recipe. And the pictures are inspired by a picture Lakshmi Arvind shared on her page Celebrations Decor from Pinterest. Scrape the coconut and mix it with sugar. Keep aside. Heat 1 tsp ghee in a pan and fry the cashews on medium till golden. Take out and keep aside. Once it's cold grind to a coarse powder. Now grind the coconut till smooth. Do it in small batches and short bursts to avoid bringing our the oil from the coconut. Place the coconut in the same pan with the rest of the ghee and start cooking on low-medium heat. stir continuously and cook for 5-7 minutes or till it start to leave the sides. Add the milk powder and quickly mix with a spatula. Scrape the bottom to avoid sticking. Once you are happy with the mixing add the powdered cashews and ground green cardamom, mix again. Check the taste if you need more sugar then add or may be more flavours with cardamom. Once you are happy take it out on a flat pan and cool down a little bit till you can handle it. Make small balls, the size of small lemons and roll between your palms to give it a smooth surface. To decorate in a mortar and pestle grind the saffron with a pinch of sugar. Add few drops of water. Mix to reveal the nice yellow colour. Using your finger put a drop of this on each Laddoo. This needs to be saved in the fridge. Stays well for a week, may be more but it never lasts more than that. I am going to switch out the cashews with almonds and try this out! The pix are lovely as usual.. so much of warmth!